Today we are sharing with you a peak of Saturday’s Hands on History session, featuring some of the Museum’s collection of jewellery and ornaments from around the world. Such objects are beautiful to the eye and have been worn throughout human history within every culture not only to enhance appearance, but also to convey status, offer protection from harm, or act as lucky talismans. In this post, though, we’re going to look at some very special pieces of jet. 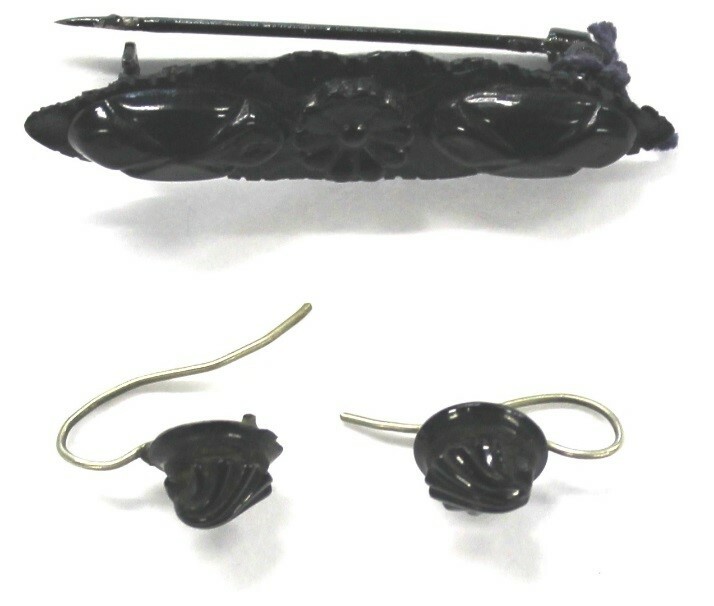 This broach, with the motif of a daisy, as well as these earrings depicting scallops, were donated to the Museum in the 1960s. Jet is unusual as a gemstone because, unlike most others, it is not a mineral. Unlike diamonds, rubies, emeralds, jet comes from the fossilised remains of ancient trees, just like coal. Jet is easily carved but is very delicate so that applying fine details requires a great deal of skill. The final product can then be polished and mounted for a striking ‘jet-black’ feature. The term jet-black, meaning the darkest possible black comes, as you could probably guess, from this material. Jet’s popularity has fluctuated over time. It is quite common as a find in Neolithic and Bronze Age excavations. It then fell out of favour in Britain until the arrival of Romans. British jet was collected in Eboracum, modern York, where it was processed and shipped across the Roman Empire. Popularity declined again after the Romans, with only sporadic use by Anglo-Saxons and Scandinavians, until it came into fashion again during the reign of Queen Victoria. After Prince Albert’s death, the Queen wore Whitby Jet as a part of her mourning dress. Perhaps due to this association with mourning, jet’s popularity has again waned. Be sure to drop in to see and learn about more of our collection of world jewellery from 11am to 4pm on Saturday the 16th of June.